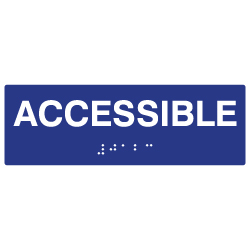 ADA Compliant Accessible Signs with Tactile Text and Braille made with attractive matte finished acrylic with eased corners. ADA Compliant Accessible Signs have 1/8" thick sign base. ADA Compliant Accessible Signs are made with 1/32" raised tactile text. ADA Compliant Accessible Signs with Tactile Text and Braille have 1" high letters. ADA Compliant Accessible Signs with Tactile Text and Braille have Grade 2 Braille. Foam mounting tape included on back of sign for easy mounting. ADA/Braille Sign Mounting Location and Height - Where permanent identification signs are provided for rooms and spaces, signs shall be installed on the wall adjacent to the latch side of the door. Where there is no wall space on the latch side, including at double leaf doors, signs shall be placed on the nearest adjacent wall, preferably on the Right. Mounting height shall be 60 inches above the finish floor to the centerline of the sign. Mounting location shall be determined so that a person may approach within 3 inches of signage without encountering protruding objects or standing within the Swing of a door.